Quite some time ago (probably a year or more), I moved my domains to Namecheap because they seemed to be pretty good and on the ball. However, the rate at which new DNS records would update on their own nameservers, massively slowed down and had to give up on using their DNS service. This is because I constantly need to plug in TXT records for gaining new SSL certificates for free. For work, this was as easy as just switching over to AWS Route53 which is super-fast to update and propagate (usually less than a minute!). However, for my personal domains, I am now switching to using Digitalocean. This is because I do not wish to have a personal AWS account and risk getting a massive unexpected bill one day, either because I'm using it more than expected, or because I got hacked. 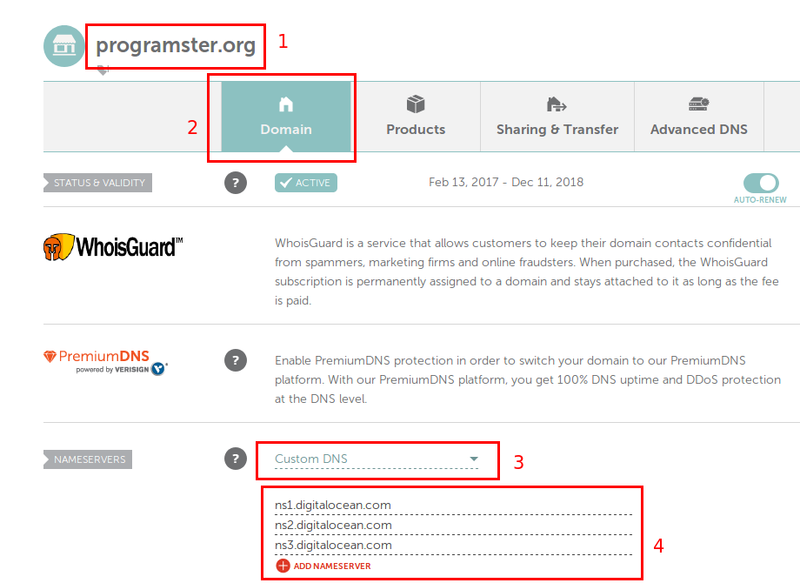 Below are the steps you would need to perform in order to use Digital Ocean for managing your DNS records (you will still need to buy/register your domain with a provider like Namecheap or AWS first). The first thing we need to do is set up the domain on Digital Ocean so that it is ready to be the replacement before we tell our current DNS provider to use Digital Ocean's nameservers for managing the DNS records. That way we never risk any downtime. Log into Digital Ocean or register an account if you don't have one already. Click on the Networking link and then click Domains. Then add your domain if you haven't added it already, and then click on it from the list of domains. Now we need to plug in our records. 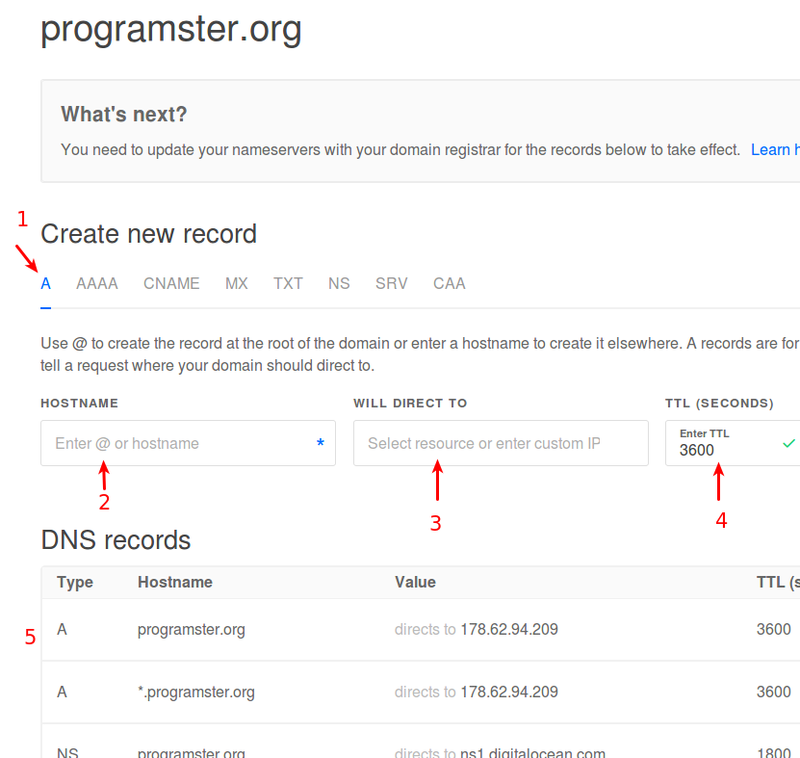 Click on the A record type (1) and then enter @ into the hostname field (2) before then entering the IP address (3) you want records to go to by default. Optionally specify the TTL of the record (4) (how long it should be kept in cache for). Then repeat those steps with the * character. Then repeat with all your current subdomains for your existing DNS records from your current provider (e.g. www etc). Don't forget to use (1) for creating your MX and CNAME records. 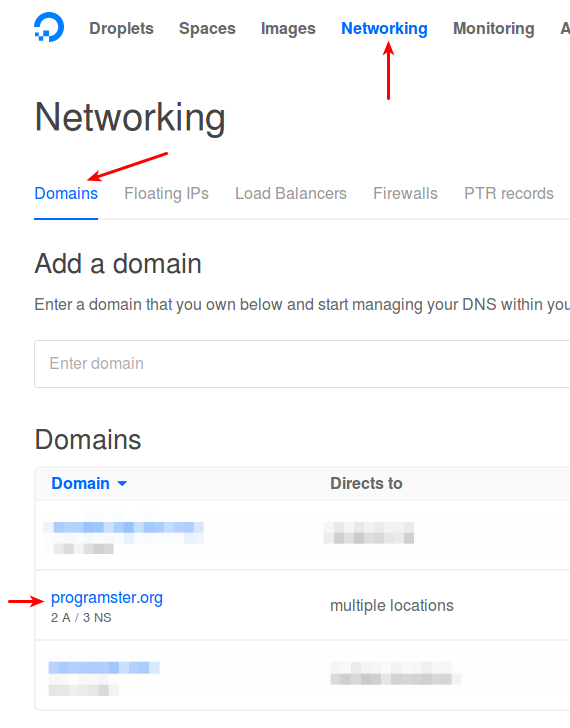 Now if you are using Namecheap as your current provider, go to your domain and scroll down to Nameservers (3). Plug in Digtial Ocean's nameservers which are ns1.digitalocean.com, ns2.digitalocean.com, and ns3.digitalocean.com. Submit/save and now all you have to do is wait. It could take 24 hours for the switchover to occur, but it only took about 30 minutes for me.